Recently I received a book from Karakter Publishers to review, which appeared to be quite a challenge. It was a book to learn how to work with watercolor, something I hadn’t done before (not counting ‘messing around a bit’ with Derwent Intense). 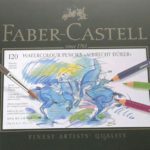 You can read the review of this book here and I’ve chosen to work with the Faber Castell Albrecht Dürer watercolor pencils. A choice of which I’m very happy in retrospect, since the result has become surprisingly beautiful. But at first I thought ‘how do I do this?’ And I can imagina that a lot of people have the same question. How do you work with watercolor pencil? What is the difference between the Albrecht Dürer and the Polychromos? I will answer these questions in this blog. I’ve also created a video of working with the Albrecht Dürer pencils, so you can see for yourself (even though spe up, or else the video would’ve become way too long) what it actually is you’re doing with watercolor pencils. And it’s super simple! The Polychromos and the Albrecht Dürer, both products of Faber Castell, are very similar. The 120 pencil sets contain the same colors, only the Polychromos are round shaped and the Albrecht Dürer hexagon. But that’s not the only difference. The Polychromos are oil based pencils, the Albrecht Dürer have a core that is competely water-soluble. When that core is touched with water it transforms and behaves in the same way as watercolor paint. The results will be similar to watercolor paint, including the transparency. In contrast to a lot of the cheap varieties of watercolor pencils on the market, the Albrecht Dürer pencils fall into the ‘Artists” category. This means they’re of professional quality for artists or people earning their living with their art. Of course amateurs like me can achieve nice results with them as well 🙂 The disadvantage of a lot of cheaper brands is that the pigmentation is often moderate, which makes your work literally look ‘watery’. With these quality pencils that’s definitely not the case. Despite the transparency you’ll get fairly bright colors. And that was a lot better than I expected. With normal colored pencils you would work in layers to fill up every detail of a drawing with pigment, so no white of the paper will remain visible. Now here we’ve discovered a big difference with watercolor pencil. Although you could fill up every detail, it’s absolutely unnecessary! 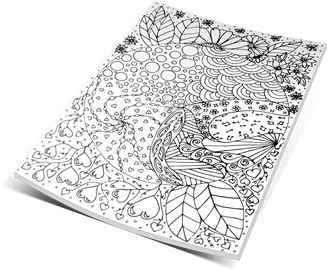 If you prefer lighter colors, just color with light pressure and little pigment will be released onto the paper. If you prefer brighter, deeper colors, you can press a bit harder. But there still is no need to fill the whole are with pigment. That’s what the water is for! In the video you will see clearly that I color several thin layers on top of one another. I work on the flower stalks and leaves of tulips, they need to be green, but in different shades. Some a bit more yellow, others a bit more blue. Therefore I work (according to the instructions of the book that was laying beside my work) with yellow and two blue shades, to be able to create the several different green shades. When the color is applied, you can then take a damp brush or a water brush to dissolve the pigment and spread it over the area you want to colorize. This works the same for all watercolor pencils, no matter what brand or quality. What is a water brush? A water brush is a brush attached to a soft plastic barrel which contains water. The brush stays moist and the need for a seperate water container is eliminated. Which is very convenient for me, because in my case a separate container would guaranteed spill over my work! Near the end of the video you see me wipe the brush on my hand. When the brush becomes drier it’s getting harder to dissolve the pigment. But when you carefully squeeze the barrel, water will enter the bristles. To prevent the brush becoming too wet, I will check on my hand to see how much water is still coming off. When that is okay, not too much water, the brush just being damp, I will continue dissolving the watercolor pigment. Near the end of the video you can also see me brushing the tip of a pencil. For that’s a possibility too. You can first color on the paper with the pencil and then dissolve it with a brush. But you can also take the pigment right off the pencil. In the video I felt that the water had dissolved the pigment too much in that particular area, so there was a lighter spot that I didn’t want there. By taking off some pigment directly from the pencil it’s possible to work more direct and add accents of fill up lighter spots. You just have to play around with it and try things. The piece of paper towel I used underneath was to prevent splashing of the pigment. In a previous try with taking off pigment directly from a pencil I didn’t use paper towel and the splashes were all over my work. Not very smart. Practice makes perfect haha. And like with so many things, with watercolor pencils it’s the same, you just have to try it out yourself. Be fearless, just get started with watercolor pencil. It’s really fun to do! By all means, I’m not pretending to be a pro on working with watercolors, I’m only sharing my personal experience. Have fun with the video below. Did you like this blog or find it interesting? Then please do leave a reply below! If you’d like to see other things in a video, feel free to share your requests. Who knows, you might see a video on it in a next blog! Duidelijke uitleg en mooie kleurkaarten. Ik zou wel eens wat willen lezen en horen over hoe je katten haren kan kleuren.